When someone suffers a life-altering injury due to the negligent actions of another party, the victim will undoubtedly need emotional and financial support. At Rosenbaum & Associates, we have a team of lawyers dedicated to the most serious injury victims. The right law firm will ensure the responsible party is held accountable for their actions and secure full compensation for the victim’s losses. Many injuries are painful and require extensive recovery time, but victims eventually recover and return to normal life. For those who suffer devastating injuries, the damage is permanent and completely life-changing. Catastrophic injuries not only cause lengthy hospitalization but also result in disabilities and a life time of financial losses. If you or a loved one was seriously injured due to the negligence of another party, consult a compassionate Philadelphia catastrophic injury attorney at Rosenbaum & Associates. Call (215) 569-0200 today to schedule a free consultation. A “catastrophic” injury is any injury that causes permanent disability, significant loss of bodily function or severe disfigurement. While some severe injuries may require long recovery times and extensive rehabilitation and therapy to reach maximum possible recovery, catastrophic injuries will prevent a victim from enjoying his or her life to the fullest, even after a long recovery time. Most people who sustain catastrophic injuries lose the ability to work, and some may require constant supervision and care after recovery. Traumatic Brain Injury – The Center for Disease Control (CDC) defines traumatic brain injury (or TBI) as injury to the brain caused by a blow, bump, jolt or penetrating injury to the head. A traumatic brain injury can lead to short or long-term impacts on a person’s language, sensation, thinking and emotion. In the U.S., nearly half of all TBI related emergency department visits are a result of falls and more than 14 percent resulted from motor vehicle accidents. Amputation – A traumatic amputation occurs when a body part is severed as the result of an accident or serious injury. If the body part or limp is totally severed, it is known as a complete amputation. In some cases, soft tissue may remain connected – this is known as a partial amputation. Partially amputated limbs may or may not be able to be reattached, depending on the severity of the injury. Birth Injury – A serious complication or medical error during childbirth can lead to lifelong injury or death to the delivering mother or infant. Common types of birth injuries include cerebral palsy and erb’s palsy in infants and excessive blood loss (in the mother). Spinal cord injury – Injuries to the spinal cord can lead to full or partial paralysis, depending upon the location and severity of the injury. Paraplegia occurs when the injury is low on the spinal cord and typically affects the lower extremities, including the use of the victim’s legs and other lower body functions. Quadraplegia (also known as tetraplegia) occurs when the injury occurs higher in the spinal cord and can involve complete paralysis of the torso, arms, legs and even the ability to breath without the assistance of a respirator. A plaintiff in a personal injury case files a lawsuit for compensation that will make him or her “whole” again. While this is open to interpretation, plaintiffs generally receive two types of compensation for their losses in personal injury claims: economic damages that repay the victim’s financial losses after an injury, and non-economic damages to compensate for things like pain and suffering, loss of life’s pleasures, emotional trauma, and disfigurement. Medical Expenses – When a case is settled or tried to verdict, that is a final determination of the claim. A Plaintiff cannot go back and seek more damages at a later point. That means all damages must be considered. This includes all medical treatment, testing, and medication that you will require for the rest of your life, as a result of the injury. Lost Income -A lawsuit will include compensation for past work loss and future earnings. Typically, we employ economic and vocational experts to project the amount of wages a client will lose over their entire work expectancy. A financial expert will likely testify as an expert witness and provide the court with a firm understanding of the victim’s lost earning capacity. With catastrophic injuries, lost wages can add up quickly, especially if a victim is unable to ever return to work. Here is an example of lost income from someone making $60,000 a year. As you can see, by year 25 this person would have lost $1.5 million dollars in income due to their injury. Life Care – If a client can no longer live independently we will have them evaluated by a life care specialist. This person will project the cost of providing home assistance to meet their basic needs or in the alternative the cost of living in a skilled nursing facility. Future Medical Expenses – In addition to current medical expenses, victims of catastrophic injuries may be eligible for compensation for future medical expenses. Home Modifications – If someone is disabled and can no longer walk unassisted we will demand compensation to redesign or reconfigure their home, so they can live as independently as possible. This may include automated lifts or replacing step downs with ramps. 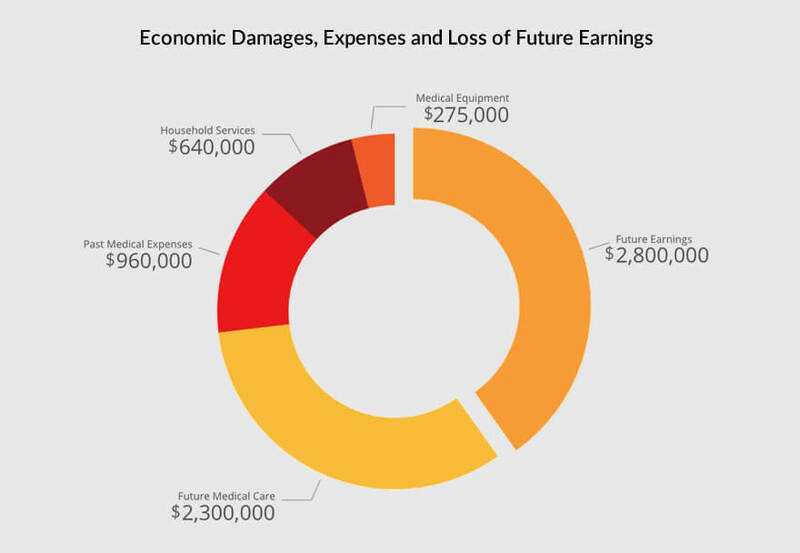 In addition to these economic damages, the plaintiff in a catastrophic injury case can also receive compensation for non-economic damages like pain and suffering and loss of enjoyment of life. For example, a plaintiff who lost his leg in a serious car accident with a drunk driver will likely consider the lost leg a much more significant loss than the cost of medical treatment. This type of injury will likely result in long-term psychological suffering and will affect multiple aspects of the plaintiff’s life. A jury will consider various evidence to determine a fair amount of pain and suffering compensation. The Plaintiff’s testimony, as well as expert medical witnesses, will play a major role. Sometimes the most powerful evidence is a video showing how our client was living before and after the injury. The amount of pain and suffering compensation a plaintiff receives generally reflects the severity of his or her injuries and how significantly their lifestyle is altered. Also, the victim’s life expectancy will influence the amount of an award or settlement. The younger someone is at the time of injury, typically the longer they will be living with the pain and suffering. If a defendant’s behavior was intentional, egregiously reckless, or the defendant showed a blatant disregard for the health and safety of others, then the jury may also award punitive damages to the plaintiff. In medical malpractice cases, these can be significant due to the expectation of medical professionals to provide competent treatment. Some states place limits or caps on the amount a plaintiff can receive in punitive damages, but Pennsylvania does not. The state does, however, limit the amount of recovery a plaintiff can receive in a case against a state or local government agency or office. How Much Will a Catastrophic Injury Lawyer Cost? Many potential plaintiffs worry about the cost of hiring attorneys. While legal fees can be expensive in some cases, most personal injury lawyers bill on a contingency fee basis. This means the attorney only collects legal fees if he or she wins a plaintiff’s case. The attorney then takes a percentage of the case award per the initial contract with the plaintiff. In some cases, a plaintiff can claim legal fees as damages in a lawsuit, so hiring a Philadelphia catastrophic injury lawyer can actually generate more compensation for a plaintiff. Motor vehicle/Truck accidents. Road collisions continue to be one of the leading causes of severe injuries and fatalities in the U.S. Drivers who experience high-speed collisions are more likely to sustain catastrophic injuries. Motorcyclists are also at an exceptionally high risk for catastrophic injuries because their vehicles afford riders very little protection when accidents happen. Accidents involving a driver who was under the influence of drugs or alcohol have a much higher chance of resulting in catastrophic injuries. Construction accidents. Many of the most severe accidents occur on construction sites due to all the heavy machinery and the work heights. However, there are certain restrictions under the law as to who you can sue. You cannot make a negligence claim against your employer and sometimes even if you are not technically an employee you may still be considered a borrowed or statutory employee. But there are typically multiple sub-contractors on a site who may be responsible. All contractors must be fully investigated to determine their role. Defective Product and Machinery. Accidents occur from all types of products ranging for power tools to children’s toys. There are typically 3 types of claims: defective design, improperly manufactured product and failure to warn of a danger. There are federal agencies set up to monitor recurring issues with products, but they typically rely on self-reporting by the manufacturer. These claims usually require very special engineering experts to determine the defect and provide alternative safer designs. Medical malpractice. Doctors, nurses, and other healthcare professionals must meet an acceptable standard of care when treating patients. This means performing medical procedures competently and administering effective treatments using approved methods. When a healthcare professional fails in this duty and harms a patient, he or she commits medical malpractice. Some catastrophic injuries that may result from medical malpractice can include unnecessary or erroneous amputations, botched surgeries, anesthesia errors, and oxygen deprivation. Common carrier accidents. Common carriers such as train companies, bus companies, and airlines have a heightened responsibility to carry their passengers safely to their destinations. Accidents involving tour buses, airplanes, helicopters, and other common carrier vehicles too often result in catastrophic or even fatal injuries. If you or a loved one suffered a catastrophic injury, the first step in determining your options for legal recourse is to identify any and all parties that may bear responsibility for your damages. This is not always as straight forward as it seems. Often there are multiple contributing factors to an accident. For example, if a bar serves a customer too much alcohol and the customer than strike someone while driving home the bar can be responsible under the “Dram Shop Act.” In a products liability claim every company in the chain of sale is responsible. This includes the manufacturer, distributor and retail store. It is critical the law firm explores all possible defendants as sometimes there is insufficient insurance to fully cover all the plaintiffs loses. The Philadelphia catastrophic injury attorneys at Rosenbaum & Associates have extensive experience with catastrophic injury cases. 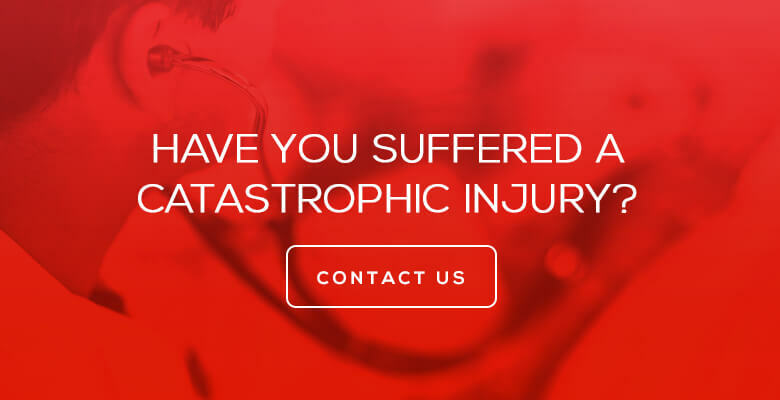 Our team of nationally recognized attorneys has more than 25 years of experience serving clients in the Philadelphia area, and we can put our resources to work for your catastrophic injury case. How Can an Attorney Help After a Catastrophic Injury? An experienced Philadelphia catastrophic injury attorney can help a victim handle his or her legal issues following an accident. The victim may be unable to work or even handle basic everyday tasks. People who sustain catastrophic injuries may require extensive in-home care or spend months or longer in a hospital. An attorney can not only help build a case against the negligent party that caused a catastrophic injury but also help a victim handle his or her insurance concerns and basic living needs during the course of the victim’s lawsuit. While some people believe that representing their own interests is a good way to save money on legal fees, this is rarely possible for individuals who experience catastrophic injuries. Handling medical concerns, rehabilitation, therapy, and countless other concerns can make managing a lawsuit all but impossible. Unfortunately, victims only have a certain amount of time to take legal action after an injury. Hiring a personal injury attorney to handle a catastrophic injury claim will enable a victim to focus on recovery instead of complex legal matters. Every state has a statute of limitations or time limit for filing personal injury claims. In Pennsylvania, the statute of limitations is two years beginning on the date an injury occurs or in some case the date the negligence was discovered. The statute of limitations is the main reason why victims of catastrophic injuries should secure legal representation as soon as possible. Attempting to meet the court’s filing deadlines on your own while managing the aftermath of a catastrophic injury can be impossible, and a plaintiff without a skilled Philadelphia personal injury lawyer may see his or her case thrown out before it even reaches trial. There are exceptions to the statute of limitations, one of which is known as the “discovery rule.” This rule applies to situations in which a plaintiff does not immediately discover the effects of a defendant’s negligence. There is also additional time for minors who can file suit up until there 20th birthday. Pennsylvania also follows a modified comparative negligence law, meaning a plaintiff may still recover compensation in a personal injury lawsuit even if he or she is partially responsible for the accident in question. However, the plaintiff loses a percentage of the case award equal to his or her percentage of fault. If the plaintiff’s fault is higher than the defendant’s, the plaintiff cannot recover any damages. If you or a loved one suffered a catastrophic injury due to another party’s negligence, the attorneys at Rosenbaum & Associates are here to help. Our team has more than 25 years of experience handling medical malpractice and personal injury claims for our clients throughout Pennsylvania. It’s crucial to know your legal options after suffering any kind of catastrophic injury. Contact our office today to schedule a free consultation, and we will let you know what to expect from a personal injury claim.